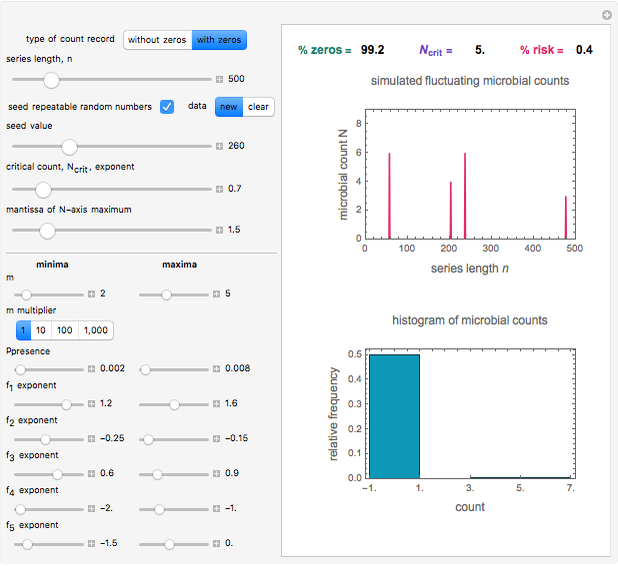 This Demonstration generates simulated microbial count records with and without zero entries. It is based on the assumption that each count is determined by the combination of several factors, specified by their upper and lower limits, which promote or suppress the population size. Where no zero entries are allowed, the counts' distribution is approximately lognormal. Where the organism, such as a pathogen, is not always present, the probability of its presence is also included as a factor. 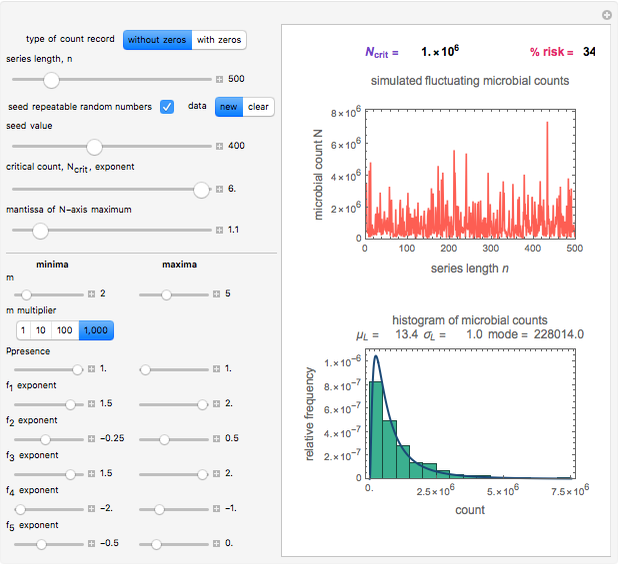 This Demonstration displays the generated counts and their histogram and calculates the risk of encountering a count exceeding a specified level considered hazardous. This Demonstration uses the expanded Fermi solution to simulate microbial count records of the kind encountered in quality assurance of raw and processed foods. The record consists of a series of count values, . The generated records are of two kinds; without and with zero entries, which can be selected with a setter. The record length, , is entered with a slider. The upper and lower limits of the initial number of microbes present, and , are also specified with sliders. It is assumed that each individual count is the result of the interplay of up to five random factors, through , whose effect is multiplicative. These factors are chosen by the user and their upper and lower limits, and , are all entered with sliders. Because these factors can vary dramatically, and they can be growth promoters or suppressors, the scales of the sliders are logarithmic (base 10). Thus, a negative setting produces a fraction of and a positive setting produces a multiplier of . In the case of records allowing zero entries, as in the sporadic appearance of pathogens, the upper and lower limits of their presence probability, and , are also entered as factors. The program then calculates the product of all the relevant factors, each assigned a random value within its respective range. In the absence of zero entries, counts calculated by this procedure are expected to have an approximately lognormal distribution whose logarithmic mean, , standard deviation, , and mode are calculated and displayed. 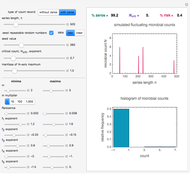 The program plots the generated record, versus , and below it, its histogram. The display also includes the percent risk of a count exceeding a level, , considered hazardous, entered by the user with a slider. 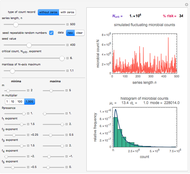 Because can vary over several orders of magnitude, its slider's scale is logarithmic (base 10). Where the record includes zero entries, their percentage is displayed above the plot. In the case of a record containing no zeros, the lognormal distribution curve having the calculated and is superimposed on the histogram. The Demonstration lets you generate repeatable random records from a fixed seed by clicking a checkbox and entering the seed value with a slider. It also allows generation of a new random count record without changing any other settings by clicking the data "clear" and then "new" setters. 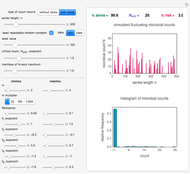 The overall size of the generated count record can be altered by the "m multiplier" setter bar and the upper limit of the microbial count -axis plot scale by a slider. This Demonstration was constructed to cover a large range of scenarios. However, not all records generated by the program correspond to a real microbial system. Although this Demonstration has been primarily intended for microbial records, it can also be used for other randomly fluctuating time series of the kind encountered in quality assurance. M. Peleg, "Estimating the Probability of High Microbial Counts Using Excel." (Feb 4, 2008) http://www-unix.oit.umass.edu/~aew2000/MicCountProb/microbecounts.html. 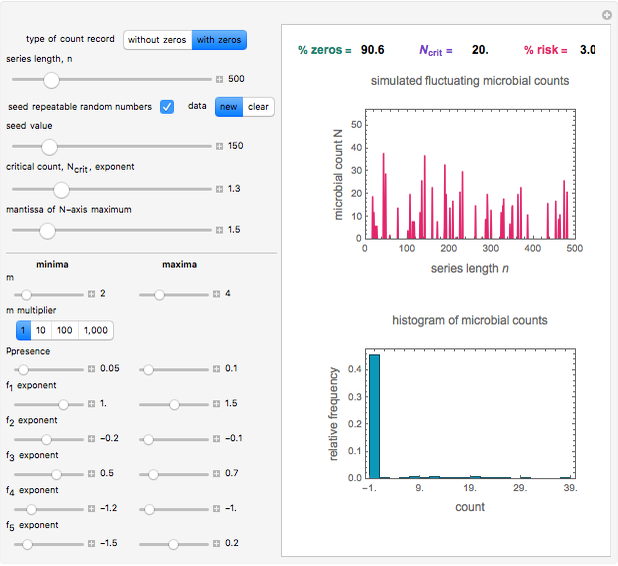 Mark D. Normand and Micha Peleg "Simulating Microbial Count Records with an Expanded Fermi Solution Model"